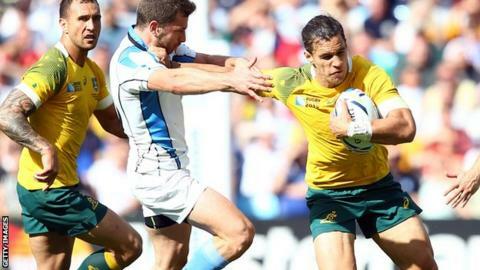 Australia have made 14 changes to the team that beat Uruguay for Saturday's crucial World Cup match against England at Twickenham. It is the same XV that faced Fiji in their opening game of the tournament. Bernard Foley returns at fly-half over Quade Cooper, with Michael Hooper alongside David Pocock in the back row and Matt Giteau at inside-centre. Australia trail Wales in Pool A after two victories, while an England defeat would see the hosts all but eliminated. England have recalled centre Jonathan Joseph in place of Sam Burgess, while number eight Ben Morgan and lock Joe Launchbury also start. Morgan believes the Wallabies' forwards will have "doubts", with the 26-17 defeat by England at Twickenham last November, fresh in their memories. But Australia coach Michael Cheika responded by saying his side would not be "looking backwards" at previous matches between the sides. "I know they think we are weak in the forwards, they are saying it out loud. They have stuck it to us the last couple of times we have played," he said. "The only place we can show the difference is on the field on Saturday night, that is where we will show our colours. Talk is cheap." Australia's eight-man replacements' bench will also be confirmed later. Wales, who beat England 28-25 on Saturday and are second in the pool, beat Fiji 23-13 at the Millennium Stadium on Thursday to head the group. The Wallabies squad has been hit with injuries, with lock Will Skelton and number eight Wycliff Palu ruled out of the tournament after being hurt against Uruguay. Sam Carter and James Hanson have replaced them. "This selection has been really clear on where we must improve and the level we must be at to compete with England," added Cheika. "We know that it's going to be a very tough challenge." Australia: Israel Folau; Adam Ashley-Cooper, Tevita Kuridrani, Matt Giteau, Rob Horne; Bernard Foley, Will Genia; Scott Sio, Stephen Moore, Sekope Kepu; Kane Douglas, Rob Simmons; Scott Fardy, Michael Hooper, David Pocock. Replacements: Tatafu Polota-Nau, James Slipper, Greg Holmes, Dean Mumm, Ben McCalman, Nick Phipps, Matt Toomua, Kurtley Beale.